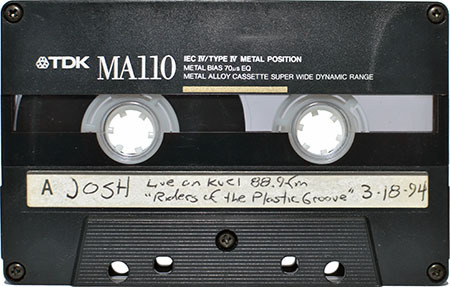 Two early live recordings of Josh McClintock on “Riders of the Plastic Groove”. These sessions took place during the years Josh recorded the first two mixes in the Acid Junky series. 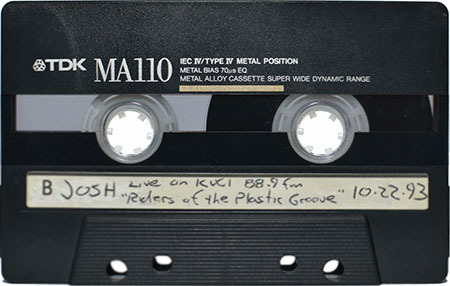 Be sure to check out the interviews with Josh at the end of the mixes. Wow, tasty tracklistings. Will check these out for sure! This is crazy Josh, because I did a show for Riders back in ’93, must have been around the same time. That was back when Joaquin (sp?) was running the show right? I just find it funny because it’s another time when our paths almost crossed back in the day. Joakim was extremely cool guy. He really appreciated the DJ’s and the music. I wonder what he’s up to these days? Do you have any of your old recordings from this show? I hope you enjoy the mixes dude! I really enjoyed both sets and, it’s always nice to hear a dope DJ who is doing it for all the right reasons. Yeah, he was cool. He’s on Facebook, I tried to reach out to him, in part becuase I wanted to see if there was an archive of the old show, but he hasn’t responded. I think he’s moved on. Which I understand. I know I’m gonna dig these mixes. I’ve thoroughly enjoyed everything I’ve heard from you to date. Keep up the great work man! Thanks Omar! And thank you Mojo….just remember your listening to baby Josh here hahaha! Just listened to both sides..good stuff i especially liked side b.earth leakeage trip..trippy track.I enjoyed the interviews to..vintage recordings..thanks for sharing Josh. Thanks Frank! See you on the dancefloor buddy! Acid chills down my spine,Haven’t felt that in a really long time,must have been 18-19 around this time. Great times. Nice one, Josh. Thanks for mentioning Crystal, may she rest in peace. Thanks Alexey. She is missed for sure! No new tape in almost 8 months…I’m sure many folks are ready for a new tape! What’s up Simfonik you throwing the towel? Let’s hope he’s just busy and will be back with some more gems soon. Awesome, Josh. I remember playing Riders in 96 or so with Kyle & Christopher upstairs at UCI. Man, those were the dayz!!! !